Go, Tracy, Go! : More Boston! I'm totally number geeking out here, y'all. 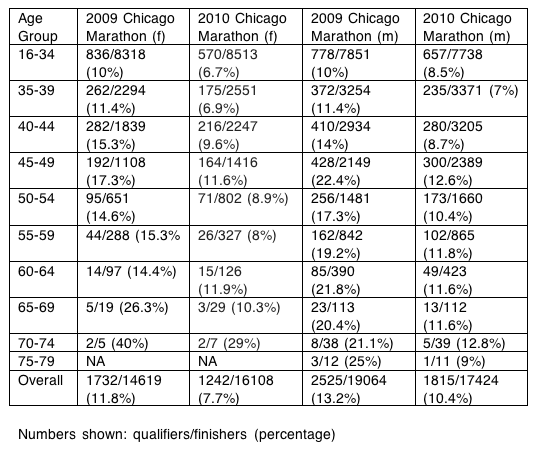 I decided to do more "how many Chicago runners qualified for Boston?" Now you have a full set of data from this year (men and women) and last year (with near-perfect conditions). Men - especially middle-aged men who ran Chicago in 2009 - seriously need to STFU about women's "lax" standards. This guy ran for charity last year. Caveats: I took exactly enough probability and statistics to know that I don't enjoy probability and statistics. And I often confuse correlation with causation. Therefore it's impossible to say whether men are trying harder to qualify or whether the standards are too easy, but oh! to be a man! I didn't really need to know that I got beat by an 83 year old man last year (by a wide margin), and I certainly didn't need to see how many people were heartbreakingly close to their qualifying times (3:41:03! that sort of thing). As an fyi that most of you probably know, Boston allows 5000 non-qualifying runners to enter the race: 1600 charity runners and other "special invitation" folks (likely how Will Ferrell got his bib several years ago). While I do personally agree that charity runners should have to qualify, I don't necessarily agree that their participation (as qualifiers or not) in any way dampens the prestige of the race. More inanity, fewer statistics tomorrow, I promise. The correlation/causation argument aside, what these numbers tell me is that the men's and women's qualifying standards for Boston appear to be pretty equivalent, since about the same proportion of men and women are qualifying. I'd hope that before Boston changed their standards in response to the quick sellout time that they'd run numbers like these for more races over more years. If these two years in Chicago are typical, then I'd say standards either need to stay the same or get tightened down for everybody. That said, I wonder how Boston picked those numbers. Are they targeting the top x% of runners? If so, maybe they need to do some research to find out what the average finishing time for men and women at that x% level is. Anecdotally, fwiw, I've heard that it's "supposed" be something like 5% of overall finishers. That makes me wonder how representative Chicago is in general - I mean, it's well known to be a flat, fast course. I would be interested to do a similar comparison with NYCM, but I think that has to wait for another day! Tracy, I'd add this observation to your comment about why middle aged runners qualify at a higher rate. My theory is that the folks at BAA purposely make the qualifying standards more forgiving for us older folks in order to get a better overall cross-section of humanity in the race. Overall numbers for participation bear this out. Even with the "easier" qualifying standards, if you look at the total number of participants at Boston (take 2010 for example), the field is drastically skewed to younger people (statistics available at baa.org). In the 2010 running of Boston, women 50+ were only 14% of all the women running (compared with men 50+ making up 30% of the men's field). That's in lockstep with your analysis above. There is one age group where the actual statistics do show an aberration. For the age group 18-39, in 2010 women made up 52% of the field. I don't really have a good guess for why this is the case, given your statistics above, since it looks like men and women in that age group qualify at about the same rate. That makes a lot of sense, Judy, thanks! Good stuff! Always better when someone else 'runs the numbers'! At the time that the current standards were set, that probably was about 5% of finishers, but hasn't adjusted as the field has grown and there's a larger number of faster (and slower) runners. As for your example of 3:40:03 being close, I think you might have a small statistical error in your calculations (not that it should make any difference but just noting): The qualifying standards as stated are actually 59 seconds slower than stated. For example, as a 30 year old male, I need to run 3:10:59 or faster to qualify, not 3:10:00 or faster. Thanks, Blaine - I made a mistake in the blog, not in the results. I do know that you get the extra :59 seconds and I'll fix it.